We have one prize package and two runner-up sets of Blu-rays and collectables to be won! We're celebrating the return of Escape To New York to cinemas this week with an amazing giveaway. First prize is a bundle of pure Carpenter goodness, including brand new Blu-ray releases of Escape From New York and Prince of Darkness. 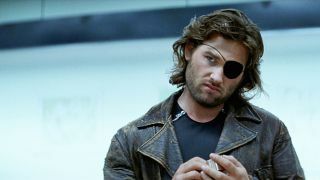 Also included in the prize package is an Escape From New York t-shirt and key ring, along with an A3 movie poster signed by none other than Snake Plissken himself, the mighty Kurt Russell! Two runners up will win Escape From New York and Prince of Darkness on Blu-ray, along with Escape From New York t-shirts and key-rings. Escape From New York and Prince Of Darkness are released on 4K Blu-ray and regular Blu-ray and DVD on November 26, 2018 - and Escape From New York is back in cinemas now.